He may be the tight ends coach, but Wilson is going to help fix all aspects of the offense. COLUMBUS – Before Kevin Wilson became known as one of the best offensive minds in college football, before he worked with Adrian Peterson (Heisman finalist) or Sam Bradford (Heisman winner) at Oklahoma or turned a non-football power like Indiana into an offensive Big Ten program, he was a football player. Despite his success with skill position players and offenses as a whole, Wilson wasn't a quarterback or a wide receiver. The recently hired Ohio State offensive coordinator was an offensive lineman at North Carolina, where he walked on in 1980 and worked his way into a scholarship as a guard/center. If you didn't know this about Wilson, it's not surprising. Even his new players, specifically the offensive linemen, didn't know that either when the former Hoosiers coach was hired by Urban Meyer in January. "He actually has an offensive line background," Billy Price said of his new offensive coordinator this spring, "which I didn't know." While the talk about Wilson's hiring has focused on the passing game and helping to bring some creativity back to the Buckeyes offense, he can also assist an offensive line in flux. Four starters from last year's unit return but questions hover over this line. Will Price make as smooth of a transformation from guard to center as his predecessor? Can Isaiah Prince live up to potential of his recruiting or will the staff need to find a new right tackle? Who is the starter at right guard? Offensive line coach Greg Studrawa is looking for answers to these as the Buckeyes head into fall, but he's not alone. Although he's designated to the tight ends, Wilson is finding time to work with the front five as well. "When the tight ends are in special teams or doing passing stuff, he’s working with us directly," Price explained. "Today he was on my case a little bit just to make sure because he’s an offensive coordinator so he is responsible for us as a head." Although the line opened holes for Ohio State backs to rush for a Big Ten-best 245.23 rushing yards per game last year, the group was not as productive in pass protection. The Scarlet and Gray were in the bottom half of the conference with 28 sacks allowed in 2016, not good enough by Buckeye standards. Working on timing between J.T. Barrett and his receivers on deep ball will certainly improve the offense, but giving the quarterback time to find players downfield is just as, if not more, important. Considering Wilson is in charge of the offense, this matters just as much to the former offensive lineman. 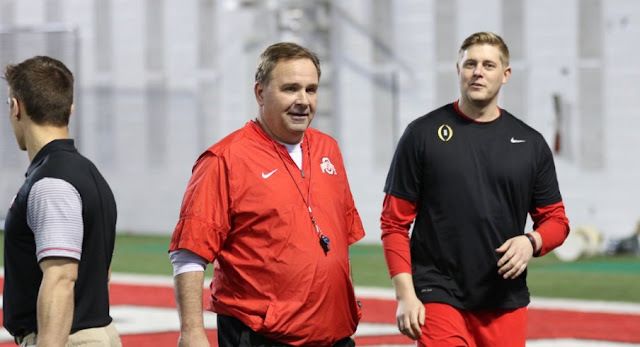 It's only been 15 full practices, but it appears Wilson's addition to the staff is already helping in more ways than even those involved with Ohio State expected. This gives these offensive linemen another coach with experience both playing and coaching the position, which should only be beneficial to all involved. "He’s doing a real good job with us," Price said of Wilson. "He’s helping Isaiah, helping Jamarco, myself. You’ve got to take a great player to be an elite player and it’s having that support system and the role models around you and he’s doing a fantastic job. I’m really glad he’s here."